Our staff all participate in various aspects of helping the clinic run smoothly. Everyone's primary role is the care of patients, but as a small clinic, we all take on other roles as well. Dr. Richard Gibbs founded the San Francisco Free Clinic with Dr. Tricia Gibbs in 1993. He is currently the President of the clinic where he continues to see patients and teach. The Drs. Gibbs are graduates of Yale School of Medicine (where they met and married), and they both completed their residency in family medicine at the University of Washington. In addition to his work at the clinic, Dr. Richard Gibbs is the Supervising Physician for the San Francisco Ballet. Dr. Patricia Hellman Gibbs founded the San Francisco Free Clinic with Dr. Richard Gibbs in 1991. She serves today as head of the clinic's diabetes program. Tricia previously was a member of the U.S. Ski Team. After her professional skiing career, she attended Yale Medical School, where she and Richard first met and married. Both of them went on to the University of Washington, where they completed their residency in family medicine. Dr. Lily Huang is the Medical Director of the San Francisco Free Clinic. She graduated from Yale University and from UCSF School of Medicine, where she remained to complete her residency in internal medicine. As a third-year resident, Dr. Huang came to SFFC on an outpatient rotation, fell in love with the clinic, and basically never left. Dr. Daniel Chrobak is a primary care physician at the San Francisco Free Clinic. He attended medical school at the University of California San Francisco, and continued his residency training there in a primary care-oriented track of the internal medicine program. In addition to his work at SFFC, he also works part-time as an internist at the UCSF Mt. Zion campus and as an inpatient hospitalist at Alta Bates Summit Medical Center. Dr. Liz Hume is a primary care physician at the San Francisco Free Clinic. She received her M.D. from Boston University School of Medicine and completed her residency in Internal Medicine at California Pacific Medical Center in San Francisco. 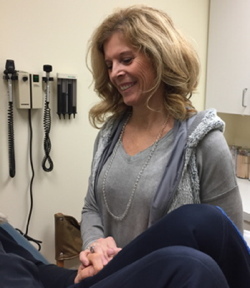 Dr. Hume has been an attending physician at the San Francisco Free Clinic since completing her residency. Dr. Emily Hurstak is a primary care physician at the San Francisco Free Clinic and leads the Quality Improvement program, which tracks data about the characteristics and needs of the SFFC patient population. Dr. Hurstak attended Yale University, Columbia University College of Physicians and Surgeons, and completed a residency and fellowship focused on primary care and public health research at UCSF. Dr. Hurstak is board certified in internal medicine and addiction medicine and is currently learning focused medical acupuncture to aid with treatment of pain and mental health conditions. Paula Martin has worked as office manager for Tricia and Richard Gibbs since the days of their private practice. She stayed on with them when they started the San Francisco Free Clinic, and has worn the many hats required to run the clinic smoothly ever since. Paula has a B.S. from Cal Poly San Luis Obispo in Kinesiology, with a minor in Corporate Fitness.